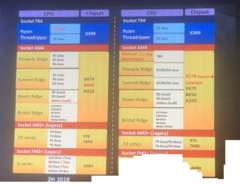 A slide from Gigabyte's internal presentation has leaked and it shows that the AMD X570 chipset will be launching at next year's Computex. The X570 chipset will support the Ryzen 3 CPUs and also bring support for PCI Express Gen 4. 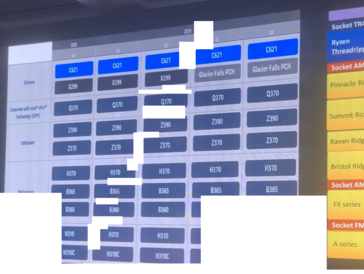 The presentation also indicated information about Intel's next HEDT CPU, Glacier Falls, and new Intel chipsets — the B365 and H310C. It also mentions 'KF' variants of the 9th gen CPUs such as the Core i9-9900KF, Core i7-9700KF, and a few non-K variants such as the Core i5-9400F and the Core i3-8100F. AMD recently announced their plans of unveiling the Ryzen 3 CPUs based on the Zen 2 microarchitecture at CES 2019. 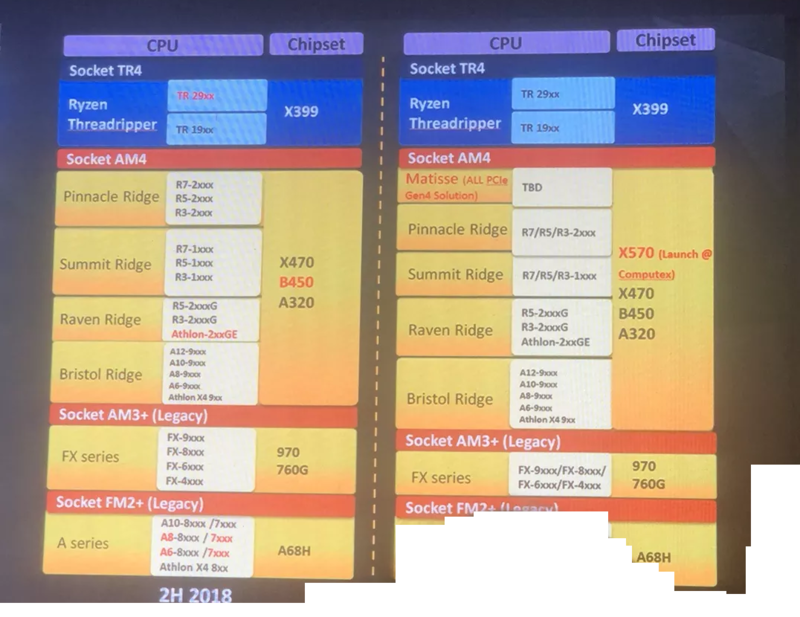 Thanks to a leaked internal Gigabyte presentation, we are now getting to know that the AMD X570 chipset for Ryzen 3 will be announced sometime during Computex 2019, which means we will be seeing motherboard manufacturers showcase their offerings around that time. The presentation says that the variants of 'Matisse', the codename for Zen 2, are yet to be announced but implies that the current chipset range will still be compatible with it, just like what AMD promised back in the day. However, the interesting aspect is that 'Matisse' will bring support for the PCI Express (PCIe) Gen 4 standard, which in all probability means that the X570 will be supporting it as well. PCIe Gen 4 was finalized last year and offers twice the bandwidth (64 GBps) of current PCIe Gen 3 lanes and reduced system latency and scalability for added lanes. AMD could be the first to implement PCIe Gen 4 on mainstream motherboards via the X570 chipset. This also gives us a hint that the upcoming AMD 'Navi' GPUs could be designed as PCIe Gen 4 cards from the ground up. The other interesting aspect of the slide was the mention of Intel Glacial Falls HEDT platform in Q3 2019. This means that the current Skylake-X-based Basin Falls Refresh will get superceded soon enough although, it appears that Glacial Falls will continue to be compatible with the existing C621 chipset. The same slide also mentions that Q2 2019 will see the launch of B365 and H310C chipsets for the mainstream market. Finally, the presentation lists new 'KF' variants in the Intel 9th generation Core series. We see the Core i9-9900KF, Core i7-9700KF, Core i5-9600KF, and the Core i3-9350KF listed along with new non-K variants viz. the Core i5-9400F and the Core i3-8100F. We are not quite sure what the new variants are and when they will officially launch but the Chinese description in the image seems to imply that the 'KF' variants will not sport integrated Intel UHD GPUs.